If you have sisters (or sister-friends) you would protect with all of your fierceness, I recommend The Girls at the Kingfisher Club by Genevieve Valentine. The selfless actions of Jo, the oldest girl, moved me to tears by reminding me of how I am protected and how I watch over the younger ones. When all the girls were forced to seize their freedom, we began to see what they are made of. And in the end, we know they were survivors, they gained their freedom and found their true-selves. Jo, however, needed to adjust to the revelations that her sisters were much more than she thought and no longer the little kids to hover over. They each have the talents and capabilities to make their own ways. This was the lesson I’ve learned a while back. And because of that, I no longer dispense unsolicited advice. Beside the fact that it was only a bad habit to boost my ego (thinking that I know better how to live their lives than they do), I also would never suffer the consequences of my weightless words. Now I trust my love ones to make their own ways. I believe they have the wisdoms to be their best selves and are smart enough to ask for help when necessary. Genevieve painted a world long ago but touched a part of something everlasting. Read this for the sisterhood. Read it with your sisters. 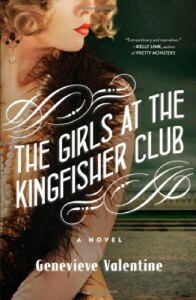 This entry was posted in I Read This and tagged book review, Genevieve Valentine, The Girls at the Kingfisher Club by n2n. Bookmark the permalink.